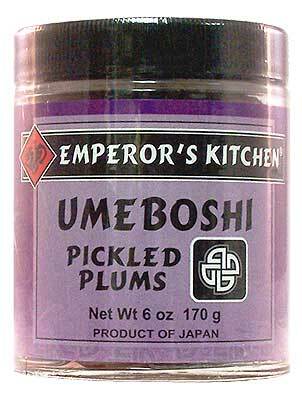 Emperor’s Kitchen Umeboshi Plums are Japanese salt-pickled plums with a delightfully tart, salty and tangy taste. 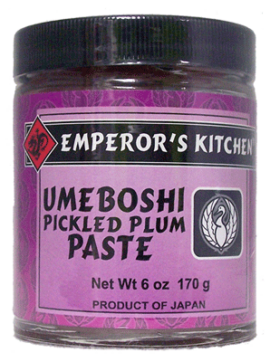 Emperor’s Kitchen Umeboshi Plums are made in the centuries-old traditional way, and are rich in beneficial bacteria. They are a lively and versatile seasoning that adds a pleasant tartness to salad dressings, cooked vegetables, and sauces. Besides their zesty flavor, Umeboshi plums are thought to have remarkable medicinal qualities. Their powerful acidity has a paradoxical alkalizing effect on the body, stimulating digestion, relieving fatigue, and soothing stomach disorders. INGREDIENTS: Umeboshi (Japanese plum), shiso (perilla leaves), sea salt.